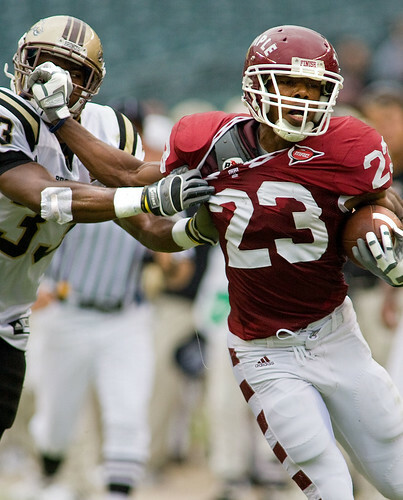 Temple's James Nixon fights off a defender during a MAC Conference football game against Western Michigan at Lincoln Financial Field on September 27, 2008. The Owls fell to Western Michigan by a score of 7-3 (TTN File Photo). And like that, another year is complete at Temple. There were highs, lows, good moments, bad moments and everything in between. With finals looming and the sweet release of summer right behind them, let’s take a look back at all that was from the 2008-2009 season. The students filed into the dorms and back onto campus as the football team opened its season with a 35-7 win over Army in West Point, N.Y. It was the first time since 2002 that the Owls won their opening game. The field hockey team also began its season with two 5-0 wins over Lehigh and Bryant. In addition, Eric Mobley was named coach of the track and field teams. It was a rough month for the football team. The Owls lost back-to-back heartbreakers to Connecticut (in overtime) and Buffalo (on a Hail Mary). The next week against Penn State, they lost DiMichele to an injury. The following week, they lost the Homecoming game to Western Michigan, 7-3. Meanwhile, the women’s soccer team also struggled, finishing the month at 2-5-2. The men’s soccer team finished the month with an average 4-3-1 record, but the best was yet to come for coach David MacWilliams’ team. The men’s cross-country team had one of its best showings with a second-place finish in the Monmouth Cross Country Kickoff. The field hockey team lost six games in a row to end the month with a 4-6 record, while the volleyball team went 8-6 over the month, including a 3-0 mark in the Atlantic Ten Conference. Also, men’s tennis coach Steve Mauro took on the task of coaching the women’s tennis team. The football team went on the road to beat Miami (Ohio), 28-10, and took down Ohio, 14-10, as DiMichele returned to the lineup. In between, the Owls lost to Central Michigan, 24-10. The golf team followed up its stellar showing at the St. Bonaventure Invitational by winning the Big 5 Championship. The field hockey team began A-10 play with three straight wins. However, the Owls followed those up with three straight losses to end the month at 3-2 in conference and 7-11 overall. The men’s soccer team went 4-1-2. Six of those games came in A-10 play to lay the grounds for a playoff bid. The women’s soccer team beat Richmond, 1-0, to nab its lone victory in a dreadful 1-6-1 month. The volleyball team lost four straight A-10 games to begin its late season slide. The football team blew a 27-7 fourth-quarter lead to Navy and lost in overtime. The Owls followed that up with a defenseless 41-38 loss to Kent State to take them out of postseason contention. Though, the Owls did end their season with a pair of victories over Eastern Michigan and Akron, finishing 5-7 — the most wins for the program since 1990. Both the men’s and women’s basketball teams opened their seasons, with the men slumping out of the gate with a 3-2 mark and the women going 3-1. The field hockey team lost in the A-10 semifinals for the fifth straight year, though this time it was a crushing overtime defeat. The 2-0-1 finish to the regular season put the men’s soccer team into the A-10 Tournament as the No. 2 seed. But, the Owls fell to Dayton, 2-1, to end their season. The women’s soccer team closed its season with with a 4-11-4 record. The volleyball team went 1-3 to end the regular season and lost to Xavier, 3-2, in the playoffs. After a home-opening loss to Miami (Ohio), senior guard Dionte Christmas hit for 35 points in an upset win over then-No. 7 Tennessee. The Owls also went on the road to beat Penn State. However, three straight losses to end the month left coach Fran Dunphy’s squad at 5-6 overall. The women’s basketball team, led by first-year coach Tonya Cardoza, fell to Rutgers, Florida State and Villanova and beat Toledo, Tulane, Ball State and Dartmouth. The Owls stood at 7-4 overall. The men’s basketball team won seven of nine games to begin the season at 4-2 in A-10 play. The Owls dominated the likes of La Salle and Richmond but lost to a lesser team in Massachusetts and were frustratingly inconsistent against Rhode Island. During that stretch, former coach John Chaney and Dr. Ray Moyer were inducted into the Temple Athletics Hall of Fame. The women’s basketball team fell big to Duke but began the year at 4-2 in conference with key wins versus Dayton and St. Joe’s. After losing to powerhouse Xavier, the men’s basketball team rattled off five wins in a row, including back-to-back road victories against St. Joe’s and Duquesne. The wins put the Owls in the bubble talk for the NCAA Tournament, but that chatter ended after two straight losses to La Salle at home and at Dayton. At the end of the month, the Owls stood at 17-11 overall and 9-5 in the A-10. The women’s basketball team lost big at UMass, but that was it. Massive wins against Charlotte and then-No. 13 Xavier sent the Owls to the top of the conference. They finished the month 19-8 and 10-3 in the A-10. The fencing team won the NIWFA Championships and got 12 players selected for the NCAA Regionals, where nine advanced to the finals. Meanwhile, the lacrosse team opened its season with a 16-9 defeat to Rutgers, and the softball team began its season with a 6-3 victory over Georgetown. The baseball team started out at 2-2. The men’s basketball team advanced to the NCAA Tournament for the second consecutive year by once again winning the A-10 Tournament. Wins versus St. Joe’s, Xavier and Duquesne sent the Owls dancing to Miami as a No. 11 seed. However, sixth-seeded Arizona State downed the Owls, 66-57, to end their season and the careers of Christmas, guard Semaj Inge and center Sergio Olmos. The Owls finished the year at 22-12 overall and 11-5 in the A-10. The women’s basketball team also made the NCAA Tournament, earning an at-large bid. The Owls were seeded ninth against No. 8 Florida, and the Gators chomped down on the Owls, 70-57, in Storrs, Conn. The Owls finished the season 21-10 overall and 11-3 in the A-10. Meanwhile, Howell and fellow junior Melissa Parker were named honorable mention All-Americans, as the fencing team finished in eighth place at the NCAA Championships. The women’s gymnastics team finished in third place at the Eastern College Athletic Conference Championships, but the real story was sophomore Katie Canning, who captured the beam championship and later qualified for the NCAA Regionals. The lacrosse team lost all eight games in this month, falling to 0-9. The softball team snapped its long losing streak with a 4-3 victory against Wagner. And finally, seven straight losses didn’t affect the baseball team, as it began A-10 play with three-game sweeps of Duquesne and La Salle. Canning took home the gold in All-Around and Vault in the USAG Championships. The golf team finished its season with a fourth-place showing in the A-10 Championship. Also, the men’s gymnastics team failed to win its fourth ECAC title in a row, finishing in fourth place in the Championship. The women’s tennis team fell to Richmond in the A-10 finals, 4-0. The men’s tennis team came in sixth place in the A-10 Tournament. The lacrosse team finally won a game, beating Richmond, 12-6. The Owls finished the season with a 4-12 record. The softball team rebounded to stand 6-6 in the A-10. The baseball team stumbled after taking two of three games against UMass, losing twice to St. Joe’s and two out of three times to both Charlotte and Xavier. They stood in third place the A-10 standings. Finally, the Jacksonville Jaguars selected defensive tackle Terrance Knighton with the 72nd overall pick of the NFL draft. The Owls go 0-2 during weekend trip to California. Luis Guzman and the men’s basketball team flew by East Tennessee State in the season opener, 79-65. Brendon Creed is one of Temple’s four captains and has started four of the team’s five games.